Looking for a place to stay in Convention Center and Warehouse? Well, Orbitz has 10 hotels, most of which rate highly for Hotel Staff and Room cleanliness. 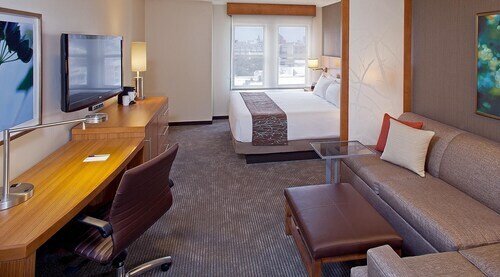 No matter what your traveling style, you're likely to find a hotel that suits your needs. 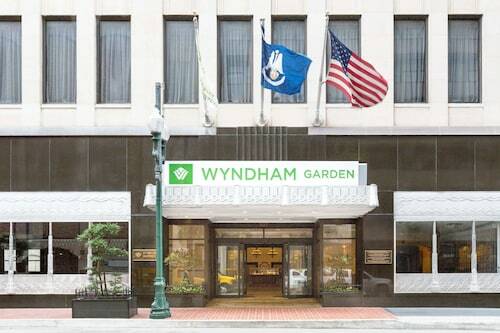 And you can always stay in the heart of the action — Mercedes-Benz Superdome, The National WWII Museum, Jackson Square, Audubon Aquarium of the Americas and Cabildo are calling your name. If you're planning a trip to Convention Center and Warehouse, consider visiting in August, September and January. Orbitz offers great deals 365 days a year, but during these months, you'll save the most — 40%, 38% and 29%, respectively. Hungry? Convention Center and Warehouse has you covered. Grab something to eat at popular restaurants like Muriel's Jackson Square, Antoine's Restaurant, Oceana Grill and Broussard's Restaurant. Louis Armstrong New Orleans International Airport is the main hub for flights into Convention Center and Warehouse and the surrounding area. Whether you're traveling solo or with the entire family in tow, you can find something fun to do in Convention Center and Warehouse. For a different kind of rush, catch a game or concert at Mercedes-Benz Superdome and Smoothie King Center. For a relaxing bit of fun, head to the theaters at The Joy Theater and Entergy IMAX Theatre. Paris Parker Aveda Salon & Spa is always on hand to help you relax and forget about work for a while. Not everyone in Convention Center and Warehouse calls it a night after sundown. Party with the night owls at Preservation Hall, Carousel Bar and Old Opera House. Some of Convention Center and Warehouse's popular attractions are steeped in culture. Soak it in at The National WWII Museum and Cabildo or New Orleans Museum of Art while enjoying a quiet afternoon. Entertainment and education abound at Faubourg Marigny and New Orleans Public Library, where you can catch up on history, fiction and current events. Xavier University of Louisiana draws students and alums alike to its campus and its atmosphere of higher education. Feel a little wind on your face while picnicking or simply enjoying a sunny afternoon at Jackson Square. Tours By Isabelle, too, shows off Convention Center and Warehouse's natural side. At Audubon Aquarium of the Americas, you can see the weird and wonderful creatures that swim beneath the surface. Head to Audubon Butterfly Garden and Insectarium for a glimpse of life beyond the high seas — all kinds of animals await to photobomb your snapshots.